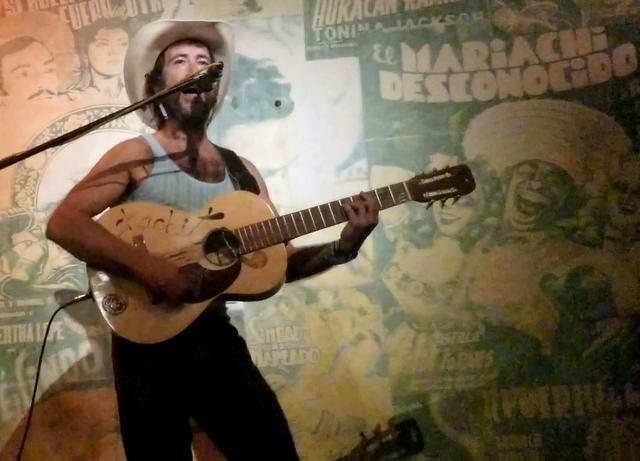 Muchachito vibrates Eastside Luv Wednesday night in a “total hoot” Reviewed by Patrick O’Heffernan on April 9, 2019 . 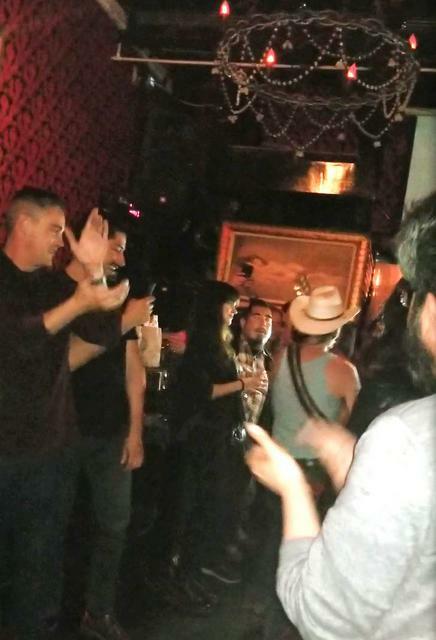 ( Boyle Heights) Eastside Luv Wine Bar, one of the focal points of the Mexican-American culture in LA, was vibrated down to its foundation Wednesday night by a Spaniard, Muchachito Bombo Infierno. Standing at the end of the bar with his personalized acoustic guitar and an amplified zapeteado platform, he bought his frenetic energy, stomping rhythms and howling humorous lyrics to the raised stage of ESL’s long bar. It was a not-to-be-forgotten night – or, as one fan said to me, a total hoot. Presented by Sunset Eclectico, LA’s homegrown Latino fusion music, arts and dance promoter credited for bringing such talents as Flor Amargo and Mono Sound to LA audiences, Muchachito put on a nonstop, rocket-fueled show that lasted forever – actually around 2 hours – and migrated from the stage to the dance pole at the other end of the bar and down to the floor where he sang, stomped, and laughed, surrounded by a forest of flashing cellphones. Muchachito (Jairo Perera) started as a singer and guitarist in Spain in 1993 with the group Trimelón de Naranjus. His history has been one of change and creativity as he developed what is now a unique, dynamic, rapid-fire flair that combines percussion, flamenco-style guitar picking, machine-gun speed strumming, often humorous lyrics, and generally wild performances. He toured and recorded with Trimelón and other musicians until 2003. He went on to play with a quartet which gained fame for jam sessions lasting as long as 9 hours. He started his own label, El Orfanato Electrico in 2007, toured and recorded in Europe and Latin America, developed the amplified platform for his feet, put out many records, toured 50 towns in Spain mostly solo in one year, returned to playing with a band, and landed in the US at SXSW. But, while his music is well known in the US Latino community from recordings, he spends little time here, so the opportunity to see him live was rare and wonderful. Muchachito sang over a dozen songs at EFL, some from his album Visto lo Visto, some old songs like “Radyo”, “Bombo”, “Tieras de Corzone,” and “Ojos de Brujo” plus some new songs. Almost all were driven by his supercharged guitar strums and foot rhythms, sometimes accelerating in mid-song as the audience clapped and struggled to keep up. Every song ended in laughter, both from Muchachito and the fans crowded onto the club’s famed Wino Bench and into the booths and bar stools along the wall and in the back. He performed almost entirely in Spanish, with a few side comments in English – but language didn’t matter for the non-Spanish speakers in the room. They were having too much fun. Eastside Luv was a perfect venue for Muchachito. Its long history as a pocho bar that celebrates the unique Latino-American culture of Los Angeles, plus its location across the street from Boyle Heights’ famous Mariachi Plaza attracts a clientele of Latinos and Anglos of all ages who love Latino, Latin and fusion music. Founded in 2006 by Boyle Heights native Guillermo Rangel Uribe — a very successful engineer and construction manager who grew up a block from what is now the ESL – he created a place “where people can be as Mexican as they want to be and as American as they want to be”. ESL offers unique drinks, deep red flocked interior with references of Chicano culture, a constant stream of great local and touring talent, burlesque and cabaret, and the best Micheladas in L.A. The result is an audience tuned in to Muchachito’s Spanish jokes and lyrics, rapid Latino rhythms and total sense of fun. We are still vibrating and looking forward to more Muchachito trips to the US and more total hoots.